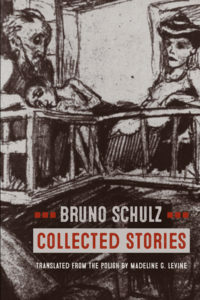 The following is an excerpt from Collected Stories by Bruno Schulz, translated by Madeline G. Levine and with a foreword by Rivka Galchen. Foreword copyright © 2018 by Rivka Galchen. Published 2018 by Northwestern University Press. All rights reserved. Simply because it is an ending, death can take on the misleading appearance of an explanation, as if it is the unhappy resolution to a riddle. Consider the story of the death of Homer. The Oracle of Delphi had prophesied Homer would die on the island of Ios. When he reached the island, he asked some fishermen there what they had caught. One replied: “What we caught, we threw back; what we didn’t, we kept.” Homer resolved not to leave Ios until he solved the riddle. Never divining the answer, he died there. It’s a bit of a drastic end, for one of the greatest poets to be undone by a schoolboy’s sort of riddle. Let us try, at least for a spell, not to think of the story of Bruno Schulz in this way. What characterizes the world made by the words of Bruno Schulz? For one, the inanimate is regularly made to seem alive, even self-aware. Doors are “witnesses,” lamps are “dejected and peevish,” and the “mournful grayness of the city” besieges a family on all sides. We read of this grayness “blossoming in the windows as the dark rash of dawn, the parasitical fungus of twilight . . .” Strange and uncanny botanies appear in other guises as well: “The city is under the sign of the weed, of wild, passionate, fanatical vegetation,” Schulz writes of Warsaw in “The Republic of Dreams.” Even Schulz’s more literal biological descriptions read as phantasmal. Here he is, describing ordinary growth: “From a pinch of chlorophyll it brings forth and expands in the fire of these days that lush, vacant tissue, the green pulp disseminated a hundred times onto millions of leafy surfaces, greenly pierced with light and veined, diaphanous with watery, vegetative, herbal blood, moss covered and hairy, with a pungent, weedy, rustic odor.” Schulz is often compared to Kafka, but this seems more a matter of history than of imaginative affinity. Kafka’s worlds, with their paradoxes and recursive anxieties, have the immaculate quality of mathematics and physics. Schulz’s world by contrast has the inescapable and encroaching biology of a voyage through the tropics, even as his literal latitude runs through a cold eastern Europe. The tendency of the inanimate world to feel and reproduce at times crosses over into its logical inverse, with people becoming things. At one point the father asks, “Am I to pass over in silence that my cousin, as a consequence of a lengthy incurable illness, changed progressively into a coil of rubber intestines, that on winter nights his poor wife carried him around day and night on pillows, humming endless lullabies to the unhappy creature? Can there be anything sadder than a man changed into an enema hose?” This is funny and tragic, and it’s also the father’s way of feeling. A sentient inanimate world requires refined, even impossible, sympathies. The father in the stories says at one point, “Who knows how many suffering, crippled, fragmentary forms of life there are, how artificially pieced together is the life of wardrobes and tables violently hammered together . . . silent martyrs to cruel human ingenuity . . . How much old, wise torment there is in stained rings of wood, in the veins and grains of our old respected wardrobes.” If life is everywhere, the labor of feeling is boundless. How to contain it? In one story, the son is sure that a stuffed condor in the living room is his father. (His mother tells him that he should know his father is just away, a traveling salesman.) It may not be true, but it seems like a viable emotional solution. These transformations are essential to Schulz’s dark humor, a humor whose timing relies on the irregular movements of Schulzian time. Time in these stories is said to leave a character and walk by itself across a room. Time also passes unevenly “making knots, as it were, in the passing of hours, swallowing up somewhere entire empty intervals of duration.” We encounter “threadbare time,” “regurgitated time” and “the rapid disintegration of time that is not supervised with constant vigilance.” Even a new extra month turns up, “a thirteenth false month,” and though we have the option of straightforwardly understanding this as the month of Adar II, a month added into the Jewish solar and lunar calendar every few years to keep the seasons in check, we can also, through the detailed metaphoric description of that “thirteenth false month,” see it as a fantastical outgrowth. I first came to the work of Schulz through an old copy of The Street of Crocodiles (the title under which Cinnamon Shops appeared in its first English translation). The image that stayed with em most from that first read comes at the end of the story “Uncle Karol.” As Uncle Karol exits his room, we learn that “moving without haste in the opposite direction, into the depths of the mirror, was someone who always had his back turned, moving through an empty enfilade of rooms that did not exist.” As the “real” Uncle Karol walks out of our gaze, his correlate in the mirror holds our attention indefinitely, even infinitely. But why, I later wondered, did I remember that moment most vividly? The “Uncle Karol” story is only a few pages, has little straightforward “event,” and concerns a minor character. The dominant figures in Cinnamon Shops are the charismatically mad father, the dreamy boy watching, and the assured servant girl Adela. Yet in one of those coincidences that can feel (maybe misleadingly) meaning-besotted, I’ve twice found myself speaking with people about Schulz and heard them recall the same moment to me as their favorite. The door through which Uncle Karol exits is a common entrance into the universe of Schulz. It leads into the vivid rooms “that did not exist” and which, in Schulz, receive their due prominence. In moments, the boy takes on the imaginative power of his father. In “Cinnamon Shops,” the young boy is sent to fetch his father’s forgotten wallet at home while his parents are at the theater. He doesn’t make it home, naturally, but ends up searching for a correlate of home, searching for the shops he boyishly terms “cinnamon shops” because they are “paneled with dark, cinnamon-colored wainscoting.” At the shops, he explains, “You could find Bengal lights there, magic boxes, stamps of long-vanished countries, Chinese decals, indigo, colophony from Malabar, the eggs of exotic insects, parrots, toucans, live salamanders and basilisks, mandrake root, windup toys from Nuremberg, homunculi in flowerpots, microscopes and telescopes, and, above all, rare and unusual books.” They are basically junk shops. But also they contain entire worlds—the vanished, the distant, the invisible to the human eye—in a small space, one available in the hometown which Schulz himself almost never left. But the young boy, on this eve, visits the eponymic cinnamon shops only in his imagination. He finds neither the shops, nor his father’s wallet, but instead, as if in a dream, arrives at the back entrance to his Gymnasium building. He doesn’t recognize it at first, seen from the other side. This space, we learn, is where an evening drawing class was sometimes held. And here the story becomes a prophecy of sorts. Bruno Schulz himself, after the publication of this story, which did not make him wealthy or famous, became the unusual and unstrict arts and crafts professor at a Jewish school for boys. I didn’t mention the “answer” to the schoolboyish riddle at Homer’s end. In some versions of the story it’s actual schoolboys rather than fishermen who offer the riddle. The answer is lice. A pretty humble answer, and maybe not even a very tricky one. It’s hard not to imagine that Homer—at least the mythic Homer—couldn’t have solved it. Maybe that is part of what is useful about the story. It allows us to think it’s not true. The story allows us to think that Homer didn’t die in that way, or maybe even at all. And at the same time the story shifts the scale to the tiny comic creatures, who surely bear us no ill will, and for whom we as humans constitute a kind of planet. The mix of obscured hopefulness and degradation in this anecdote reminded me of Schulz. Schulz was born in 1892, in the town of Drohobych, which was then Austrian Galicia and today is in Ukraine. He was Jewish, the son of a cloth merchant. He wrote in Polish, and was also fluent in German. One of the stories told of Schulz is that when he was a young boy his mother saw him feeding the last grains of sugar to the houseflies, and when she asked him what he was doing, he said he was helping the flies make it through the winter. Schulz’s narrator in “The Sanatorium under the Hourglass” not only finds his dead father at the sanatorium, but moves into the sanatorium himself. “Since the moment of my arrival,” the narrator tells us, “during which certain appearances of hospitable thoughtfulness were spun out for the newcomer’s sake, the administration of the sanatorium has not troubled itself in the least to give us even the illusion of some kind of care.” In this way, the sanatorium perfectly mirrors our own everyday life, in which we are left to attend to ourselves. Yet it’s also the place where the dead continue to live. Rivka Galchen is the author of three books, including the novel Atmospheric Disturbances. A frequent contributor to the New Yorker, the London Review of Books, and the New York Times, she has been awarded numerous prizes and fellowships and was included on the New Yorker’s “20 under 40” list of fiction writers.